Spongy foam rubber ball for your cats entertainment. Each ball is roughly the size of a Ping Pong ball (1 1/2 inches). Package contains 4 balls. 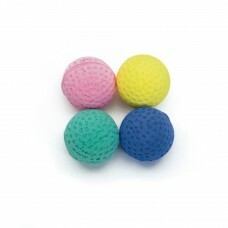 Please note these are not made of sponge material, they are a cushiony solid foam rubber ball that is very spongy.